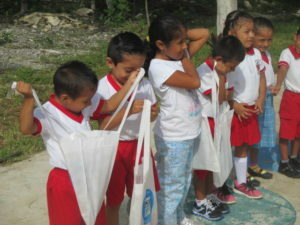 Four weeks of dedicated labor by KKIS (Keeping Kids in School) volunteers in Playa del Carmen, Mexico: sorting school supplies, packing KKIS bags with appropriate supplies for each grade level, stacking bags into plastic vegetable crates and storing them next door in our neighbor’s living room, loading trucks twice daily for deliveries and finally placing a KKIS bag of school supplies into the hands of 2,922 students has been accomplished. 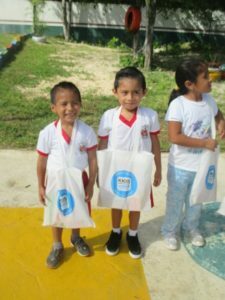 Young kids with KKIS bags. 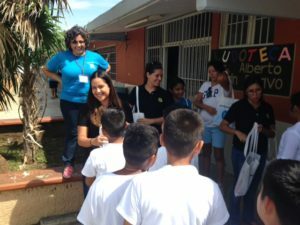 Volunteers at Rudolfo Menendez school. 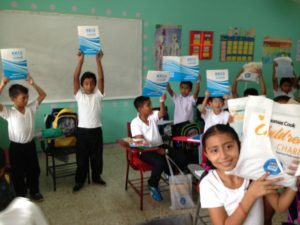 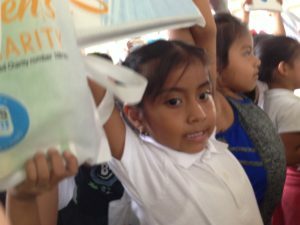 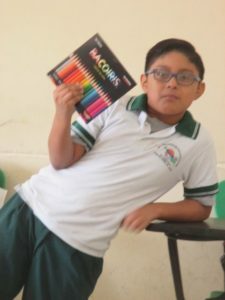 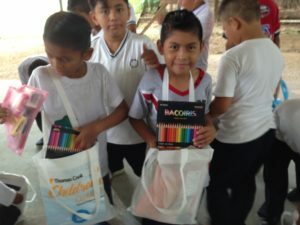 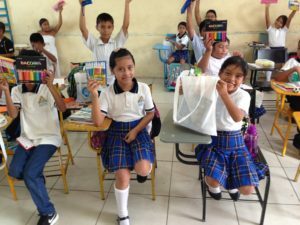 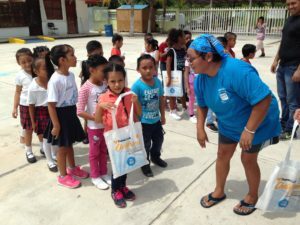 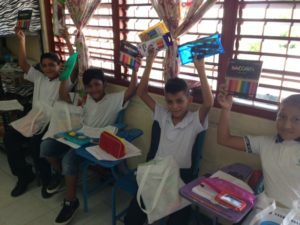 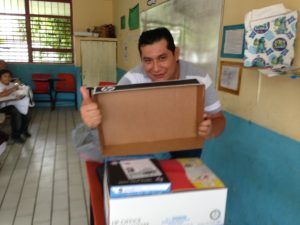 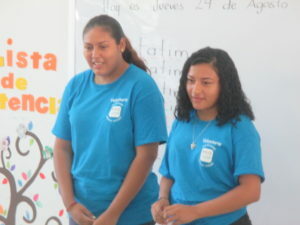 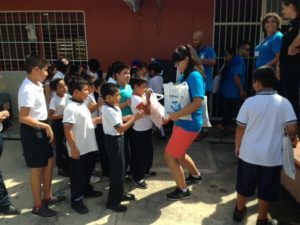 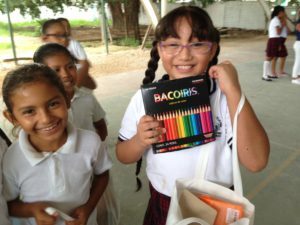 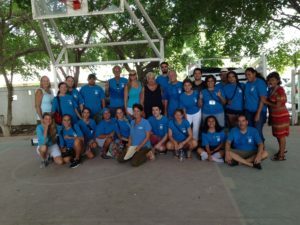 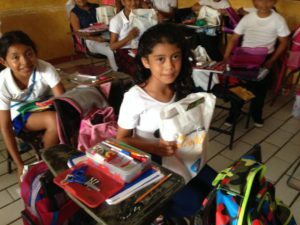 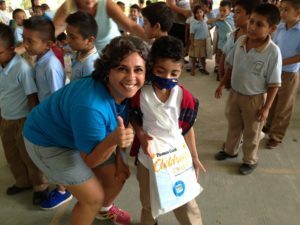 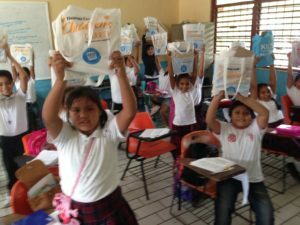 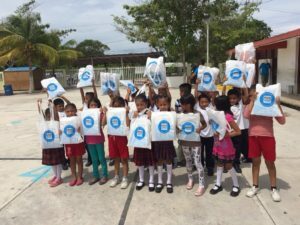 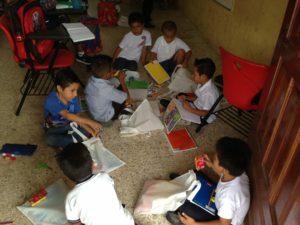 Thomas Cook Children’s Charity, Simca Desarrollos, and the Youth Connection each adopted schools and donated financially for KKIS to purchase the needed school supplies. 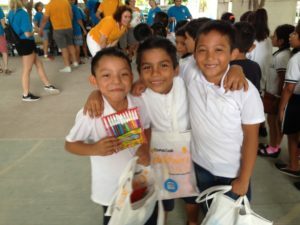 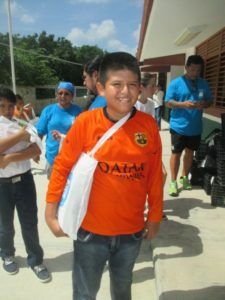 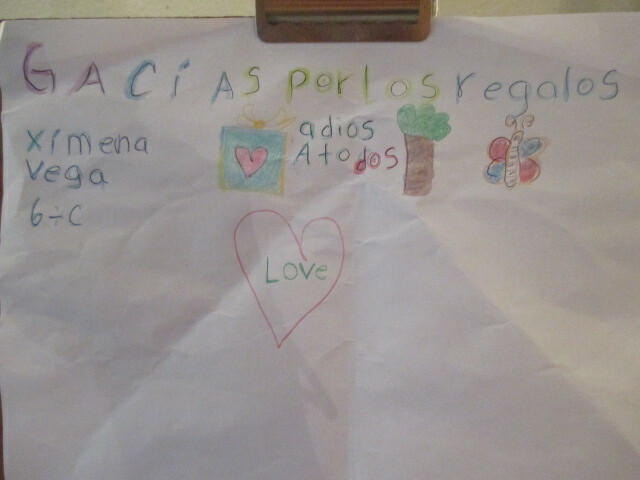 Thanks to all volunteers and sponsors these children in Playa have hopes for a brighter future. 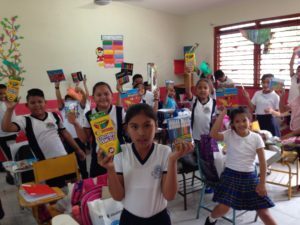 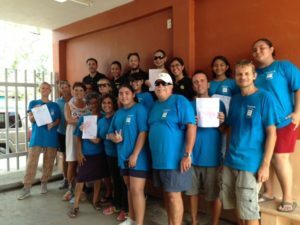 At our final delivery on Friday, Aug. 25, students ran to the front gate of Gregoria Cob Cob elementary school as volunteers were loading empty crates into trucks and delivered thank you notes drawn with their brand new colored pencils. 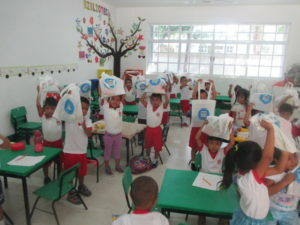 Now more and more photos of the process. 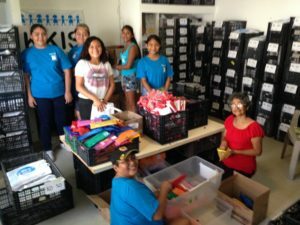 Volunteers packing KKIS bags with boxes full of bags stacked up behind them. 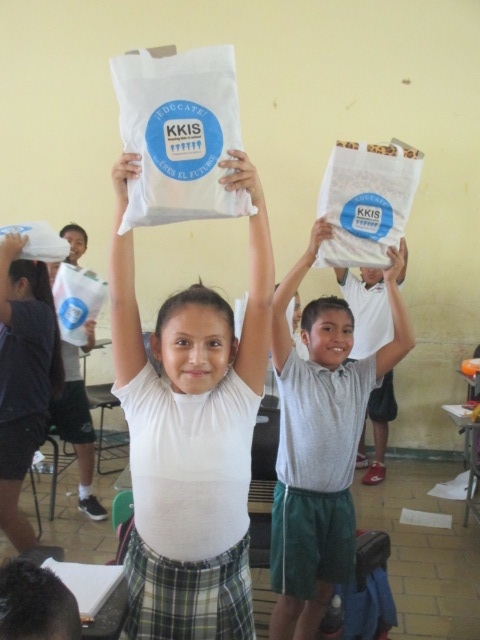 Lucia, a KKIS high school scholarship student helps deliver KKIS bags. 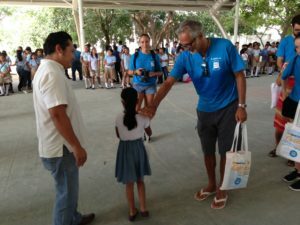 Luigi encourages a young student. 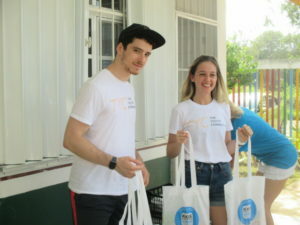 Aurora with a young man at Rudolfo Menendez school. 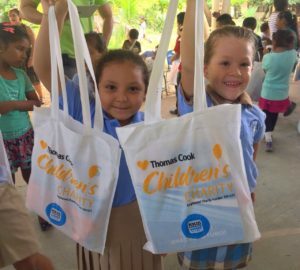 Thomas Cook/KKIS bags for kids. 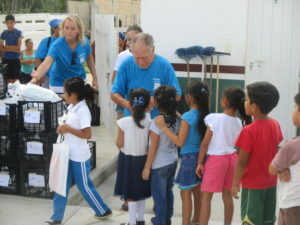 Loading the trucks with boxes of bags. 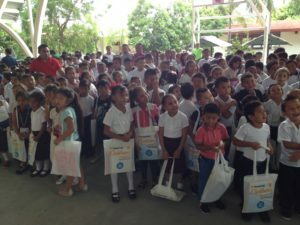 The entire Rudolfo Menendez school with KKIS bags. 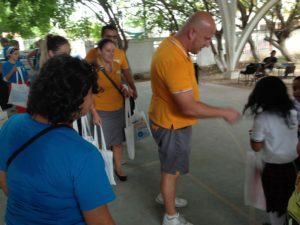 Yellow shirted Thomas Cook employees lend a hand. 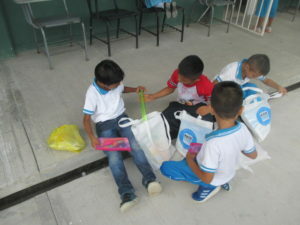 Kids exploring the contents of KKIS bags. 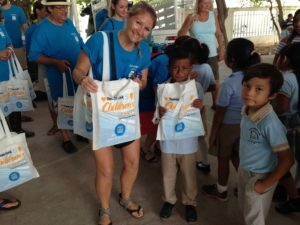 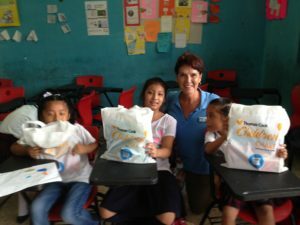 Janet with several 4th grade students and their bags of school supplies. 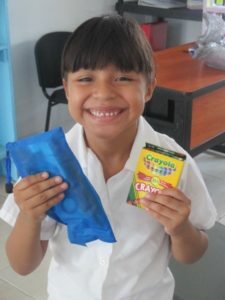 Pencil case and crayons made this smile. 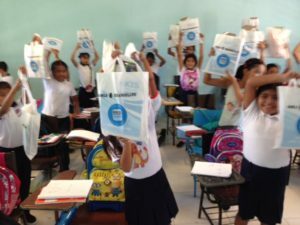 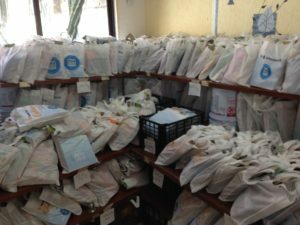 Middle school students received bags too. 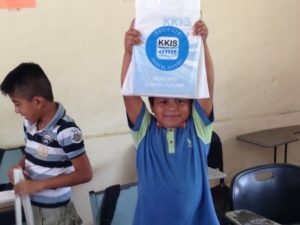 KKIS Scholarship student gives a Middle school student a bag and a hug. 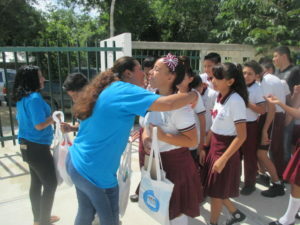 Janet with some 6th grade girls last August when school supplies were delivered.